Many brave Americans overseas attempt to do their own tax returns, and often inadvertently end up learning about tax forms they may not have been filing or filed incorrectly. 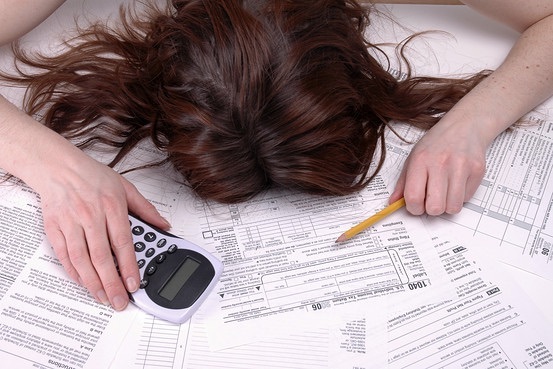 Unfortunately, many taxpayers who work with paid professionals also have ended up missing forms in their tax returns. The remainder of this article is dedicated to some of the most common tax forms that are generally part of an expat-American tax return. Whether you prepare your own return or work with a tax professional, you should be familiar with these forms. Form 2555 & 2555- EZ: These forms are for calculating your Foreign Earned Income Exclusion (FEIE) and to calculate your Foreign Housing Exclusion or Deduction. If you meet certain foreign residency requirements, you may be able to exclude up to $99,200 of earned income in 2014 and a portion of your foreign housing expenses from U.S. income tax. Note that this exclusion does not apply to self-employment taxes. If you are self-employed abroad, you are still subject to U.S. Social Security taxes unless you live in one of the 25 countries with which the U.S. has a Social Security Totalization Agreement. The FEIE is generally advantageous to use when income tax rates in the foreign country are lower than in the U.S. and/or your total earned income is below the exclusion threshold. FBAR Form FinCEN 114: This form is independent of the tax return and a separate filing requirement. The FBAR applies to any U.S. person who owns, has beneficial interest or signature authority over foreign financial accounts that exceed $10,000 in the aggregate in value at any time during the year. If you have any foreign bank accounts, this also has to be disclosed on Part III of Schedule B, whether the FBAR is required to be filed or not. FinCEN 114 must be e-filed and cannot be mailed, with the absolute filing deadline on June 30, with no extension possible. Form 8938: This form, also known as the Fatca form, is used to report Specified Foreign Financial Assets and the income derived from them. There is some overlap with the FinCEN 114 Form (FBAR), but the filing thresholds are higher, and depend on the taxpayer’s residency and marriage status, with different thresholds for the highest value reached during the year and on the last day of the year. These thresholds range from a low of $50,000 to a high of $600,000. If you received a gift or inheritance from a foreign person, even though it will generally not be taxable in the U.S., depending on the amount, you may have to report it in Form 3520. This form is also used to report transactions that you had with foreign trusts. If you are grantor in a foreign trust, you are likely required to file Form 3520-A in addition to form 3520. If you run your own business in a foreign country, you may have established a company to conduct your business. Depending on the entity’s classification for U.S. tax purposes, which will be a corporation by default or will depend on the classification election made through Form 8832, you may be required to file Form 8858 if the entity is disregarded; Form 5471 if the entity is classified as a corporation; or Form 8865 if classified as a partnership. Transactions between you and your foreign company may have to be reported on Form 926. If you live in a country with which the U.S. has an income tax convention, you may be entitled to certain treaty benefits with respect to your foreign retirement accounts, re-sourcing of certain U.S. source income to avoid double taxation, taxation of foreign social security, etc. The treaty-based positions taken in your return may have to be disclosed in Form 8833. If you have a brokerage account or other investments (including some foreign retirement accounts) in a foreign country, these investments may be classified as Passive Foreign Investment Companies or PFICs, which are subject to special tax rules that are generally unfavorable in nature. Most foreign mutual funds and ETFs are classified as PFICS. Each PFIC you own is reported on a separate Form 8621. Other forms that could also apply to your situation include Form 5173: Transfer Certificate which is issued by the IRS upon the death of an American citizen overseas, and is a discharge form confirming that all taxes had been paid and which is often required by banks and brokerage firms to release funds to the estate; Form 5472 for certain U.S. corporations with 25% foreign ownership and certain foreign corporations engaged in a U.S. trade or business; and Form 720, Quarterly Excise Tax Return, to report and pay excise taxes on certain foreign life insurance premiums. 1040: Ultimately all of your income (foreign and domestic) should end up on your form 1040. Americans married to non-Americans may be able to us the Head of Household filing status instead of married filing separately. In some cases adding a non-citizen spouse (and their income and assets) to the U.S. tax return can be beneficial. All dependents on the return, must have a U.S. tax ID number. 1040: – Schedule A: Some expenses related to being overseas may be able to be claimed as itemized expenses such as certain foreign taxes, certain moving expenses and travel, mortgage interest, medical and dental expenses etc. 1040: – Schedule B: Part III of Schedule B has information related to foreign trusts and foreign bank accounts. Make sure you check these correctly. 1040: – Schedule C. If you live overseas and are self-employed, you will still have to file a Schedule C. You may be subject to U.S. Social Security though Totalization Agreements may negate the need for paying into U.S. Social Security. You will also generally be able to contribute to a U.S. solo 401(k) or SEP IRA but these may not be tax-deferred in the country where you live and work. For more information about overseas tax returns, you should check the IRS’s website, which has thousands of pages for your reading pleasure in a section dedicated to International Taxpayers. A good starting point for any new overseas American is Publication 54: Tax Guide for US Citizens and Resident Aliens Abroad. This entry was posted in Americans, Compliance, Education, Expats, FATCA, Form 5471, Green Card Holders, IRS, Tax, Trusts, Uncategorized, US shareholders, USD by Adrian Rowles. Bookmark the permalink.